...a collaboration of vocalist-composer Dorothy Collins & keyboardist-composer Ian Ferrin. Dorothy Collins started singing shortly after she came into this world. Her musical experience ranges from classical to gospel to jazz, and more. Dorothy performs regularly at jazz clubs in Southern California (Restaurant Kikuya, Steamers Cafe, Spaghettini Jazz Club and Grill, and other great venues), accompanied by the Mark Massey Trio. By day, Dorothy works as a professional graphic designer, and she created the beautiful design of the Emily CD. Ian Ferrin was born, raised and graduated from college in Arcata, California (Huboldt State)–arguably the most liberal town in the United States. His father worked for a big local logging company and his mother ran campaigns for local democratic politicians. Ian is an experienced performer and songwriter. As well as making the music of his heart, Ian works by day as an ICU Registered Nurse. Ian and his wife Denise live in rural Northern California, near Chico. In October of 2000, Ian approached his friend Dorothy with the idea of doing an album of songs using Emily Dickinson poems as lyrics. The project started with this simple concept but swiftly grew into a labor of love. How could it not with some of the most wonderful words in the universe for lyrics? 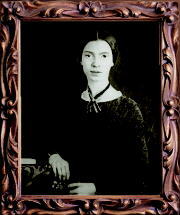 Emily Dickinson was born December 10, 1830 in Amherst Massachusetts, and lived in her family home until her death in 1886. She grew up among friends and family, attended a local college and enjoyed the privileges afforded the daughter of a respected attorney. She was a keen observer of the world around her, and much about her is revealed in her letters. While she maintained several relationships with writers and critics with whom she shared her work, she chose not to publish her poetry, and lived an increasingly reclusive life. She felt deeply and expressed with eloquence and skill a love for nature, a penetrating intellect, and a fascination with the visible and invisible structures of human experience. Her poetry has been read, memorized, studied and cherished for nearly 150 years, and will certainly delight and intrique people for years to come.